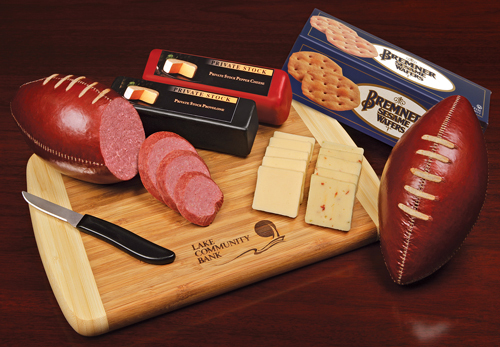 It’s not a football but a football shaped beef summer sausage. Perfect for game watching and for all those sports lovers. Good for closing gifts during football season. Imagine giving this as a referral thank you gift in January. Add your logo to the bamboo cutting board. In addition to the twelve ounces of summer sausage, there’s a seven ounce block of provolone and mile pepper cheese, a box of Bremnet wafers and a handy cheese knife. Long after the food has been enjoyed, your recipient can enjoy the fire-branded cutting board. Minimum is 12 sets and #L653 is the item number. Imprint area is 3-1/2″ x 1-1/2″. Cutting board is 12 x 8 x 3/4″. Reg price is 69.95 ea. Sale 42.00 through Dec 10, 2015. Item L653 this is a web only item.